Colorado topo maps should be an important part of your gear if you plan on pursuing any outdoor activity in Colorado such as hiking, backpacking, bicycling, canoeing, hunting, or even metal detecting as I do. The topography of this State is one that is both beautiful, and dangerous. Here’s why. Colorado is 104,091 square miles. It is engulfed by the Rocky Mountains. Colorado’s land mass is 103,595 square miles, and 496 miles of water. Colorado’s average elevation of 6800 feet makes it the country’s highest State. It has 54 peaks that tower 14,000 feet or higher. The Western Great Plains dominates the eastern side of the State. This large plateau engulfs approximately one third of the State as it extends to the foothills of the Rocky Mountains. The Continental Divide separates the Rockies eastern and western slopes. On the eastern slope of the Rockies is the Rampart Range. South of this Range is the Sangre de Cristo Range. The western area of Colorado is a vast mesa. It is made up of long, flat, plateaus, and deep sweeping ravines. In the northwest are the Uncompahgre and Roan Plateaus, the Grand Mesa, the Danforth Hills, and the Flat Topps. 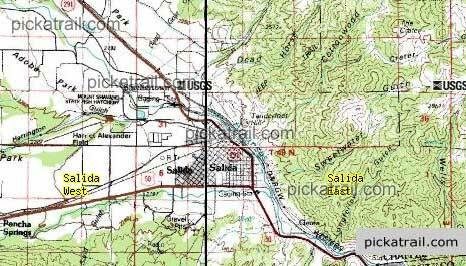 Topo maps can be a useful tool when canoeing or rafting along one of Colorado’s waterways. The waterways of this State consist of the Blue Mesa Reservoir, the States largest lake. The Colorado River runs southwest from the Rockies into Utah. The North Platte River runs north to Wyoming. The South Platte River runs northeast into Nebraska. The Rio Grande River runs south into New Mexico, and in the east, the Arkansas and Republican rivers flow to Kansas. There are so many types of topos that the enormity of the choices can actually end up confusing the consumer looking to purchase one. However, because of all those choices of maps to choose from, the quality of the maps has increased over the years. Although there have been many new map producers entering the market, I believe the best topos are still being produced by long standing companies like Garmin, DeLorme, and National Geographic. Whether you are looking for Colorado maps that are software, or a hard product like the Gazetteer, I’m sure you will be surprised at the variety and the features of the many maps that are listed below. For a better understanding of topography maps please visit my page here. To Find These Areas, Topos Are A Great Tool! Any time you venture into the Colorado outdoors you should be carrying one or two Colorado topo maps. And, if you enjoy the hobby of metal detecting, or you are thinking about pursuing the hobby, using Colorado topo maps to locate these areas is a definite advantage.